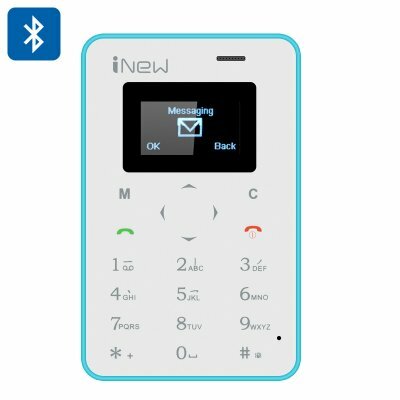 Successfully Added iNew Mini 1 Credit Card Phone - Quad Band GSM, Camera Trigger, 320mAh Battery, Bluetooth Sync (Blue) to your Shopping Cart. The iNew Mini 1 is probably the smallest GSM phone around. The mini phone is super thin, super light and would fit into your wallet, pocket and even business card holder. So, if you appreciate minimalistic design, simplicity and efficiency – the iNew Mini 1 is a great option for a secondary phone or even a primary one. TheiNew Mini 1 is an independent GSM device that function all it by itself or act as an addition to your primary smartphone. With quad band GSM coverage, you can always stay connected, make and pick up calls and pretty much the iNew Mini working independently as your communication device. Alternatively, you can use the mini phone as an addition to your primary one. Thanks to Bluetooth support, you can sync your messages and even use the phone as a trigger for your smartphone camera (if you are on Android).You can also connect the mini phone to other devices – mp3 players, speakers and more. Despite the phone’s tiny size, it comes with a nice 320mAh battery, letting you talk non-stop for up to 2 hours and offering 4 hours on standby. The MTK6261D processor will efficiently back up the mini phone’s functionality. The mini display is only 0.96 inch in size and comes with 128x64 resolution.